This experiment is designed to show how fluoride protects the calcium in eggshells against the softening effects of acid. Fluoridated toothpaste is used to coat part of an egg, which is then soaked in vinegar for several hours. The vinegar will soften the toothpaste-free part of the egg shell, while the part covered by toothpaste remains hard. The action of the vinegar on the eggshell parallels the action of acid-forming sugars and bacteria on unprotected tooth enamel. Wash and dry a room-temperature egg and coat it with a toothpaste containing fluoride. Apply the toothpaste in a coat at least ¼ inch thick and fill in any air bubbles. Wash and dry another room-temperature egg but don't coat it with toothpaste; this is your control egg. Use a spoon to place each egg in the bottom of a wide-mouthed jar or drinking glass. Pour white vinegar into the glasses, deep enough to cover the eggs. Rest the bowl of a teaspoon across the top of each egg to hold them down in the vinegar if they float. Leave the eggs undisturbed in the vinegar for 7 hours. Bubbles will form on the shell of the unprotected egg while it is soaking in the vinegar. This is a result of the calcium dioxide gas formed by the acid in the vinegar reacting with the calcium carbonate in the eggshell and dissolving it. (See Reference 3) Dental plaque forms acids which dissolve the calcium in tooth enamel in the same fashion, albeit more slowly. Use a slotted spoon to remove the eggs carefully from the vinegar. Rinse the toothpaste off the coated egg. Gently rinse the vinegar off the control egg. Gently pat both eggs dry. 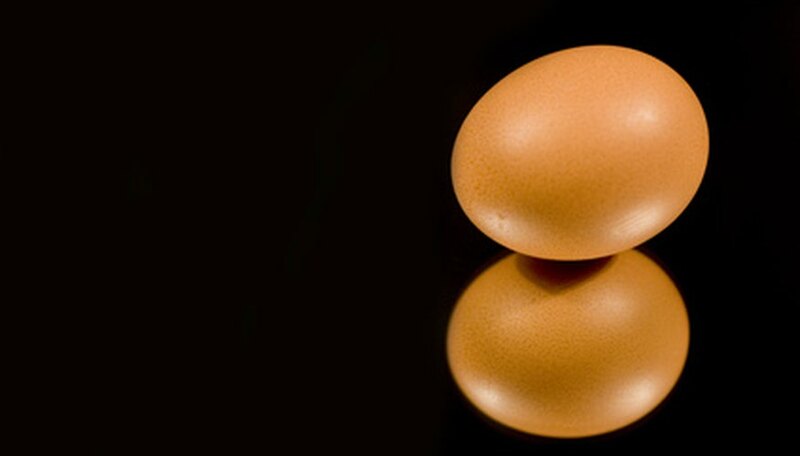 Feel the shells; the shell of the egg that was protected by the fluoride in the toothpaste will still be hard, while the shell of the control egg will be very soft and fragile. If it is not, put it back in the vinegar until it is (up to 5 more hours). The fluoridated toothpaste protected the eggshell from the acid in the vinegar, while the vinegar leached the calcium from the control egg and dissolved the shell away from the egg's membrane. If you want to expand this experiment, try using additional eggs covered with non-fluoridated toothpaste and soaking coated and non-coated eggs in plain water. Stephens, Siva. "Toothpaste Experiment With Eggs." Sciencing, https://sciencing.com/toothpaste-experiment-eggs-7785251.html. 24 April 2017.